The SMD water pumps are available as standard and configured pumps to meet the demands of different water applications. With a best-in-class hydraulic design, the SMD pumps can take on challenges in raw, clean, sea and brackish water applications. 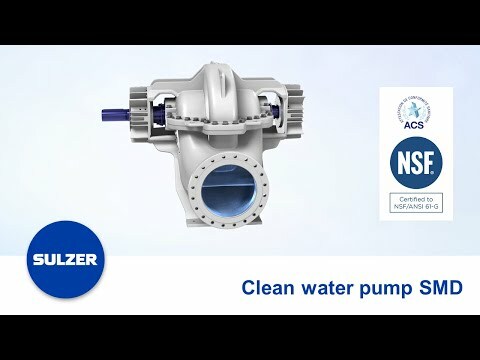 The clean water pumps have ACS and NSF 61 drinking water certifications. Head Up to 260 m / 850 ft.
Standard SMD, focused on municipal water treatment, supply and distribution where typically a higher level of standardization is required, allowing the most cost effective solutions and shortest lead times. Configured SMD combines standardization and modularization to offer a number of configurable options to meet the most common requirements of the water abstraction, transport and desalination industries. The SMD pumps are certified with the NSF /ANSI 61 certification. In the certification process, the pump has gone through a variety of testing to ensure safe pumping of drinking water. The SMD pumps are certified by ACS. The certification ensures that the pump is approved for pumping potable water.